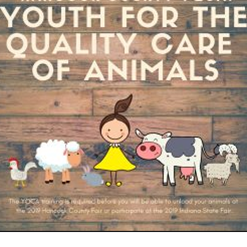 Starting in 2019, California is requiring all junior livestock exhibitors to be certified through the Youth for Quality Care of Animals program. This is a web based program each exhibitor can do at home. Please visit the YQCA website for more information or go to the registration page to complete the certification. Getting Your YQCA Web-Based Certification Click here for more information of here to get your YQCA certification! Click here for more information of here to get your YQCA certification!